Healthcare informatics lies at the intersection between two already complex fields, so it’s no surprise that it’s a difficult business to learn. The acceleration of technological advancement plotted out on a two-axis chart looks like a rocket ship taking off.In less than a generation, we’ve gone from green screen text on tiny CRT monitors to powerful handheld devises now able to wirelessly interconnect with any other device on the planet. It’s equally clear that the explosive growth and technological advances occurring in both those fields are going to continue to drive demand for professionals who can keep up with the complexity. In fact, there are still clinics and hospitals out there using those antique, text-based green screen systems. According to international consultancy firm Deloitte,global health care expenditures are expected to grow at an annualized rate of 5.4 percentin the five years leading up to 2022, an increase of nearly $3 trillion. And healthcare technology as one of the supporting factors for that growth. Without a strong workforce of health information experts, that growth may grind to a halt… even though the demand for healthcare never will. With a bachelor’s degree in HIM, you’ll find a place for your technical talents in a field where salaries are rising amid a growing demand for talented professionals with the right mix of skills. But the very fact that it’s such an in-demand field means finding an affordable degree program can be a challenge. That’s exactly why we took the time put together a list of the best-priced CAHIIM-accredited HIM degrees the country. CAHIIM, the Commission on Accreditation For Health Informatics and Information Management Education is an independent accreditation agency recognized by the Council for Higher Education Accreditation (CHEA)as the primary body for establishing and enforcing quality standards for higher education programs in healthcare informatics. The standards also go into supporting knowledge from the medical field, ensuring you have the kind of grounding you need to dive into the sometimes esoteric elements of medical terminology. But the process doesn’t stop with the curriculum. CAHIIM also looks at factors such as the program mission, goals, and faculty development. They mandate an advisory committee to help keep programs aligned with evolving industry requirements in a field where change takes place nearly as rapidly as technology itself. The reasons we restricted our list to CAHIIM-accredited programs should be obvious: as the field of healthcare IT grows and professionalizes, employers need to know they are hiring candidates with an education that meets a high level of knowledge and expertise. Sure, the final proof of your job-readiness usually comes with the AHIMA (American Health Information Management Association) certification you end up pursuing after you earn your degree. But even that relates back to the quality and reputation of your undergraduate program since holding a CAHIIM-accredited bachelor’s is the standard way to qualify for AHIMA’s RHIA (Registered Health Information Administrator) certification exam. By attending a program that CAHIIM has given its stamp of approval to, you can be sure that any prospective employer out there will take one look at your credentials and recognize you as a qualified candidate. Even though we’re giving you the best priced programs available, that doesn’t mean any of them are cheap. Health Informatics isn’t an easy field to learn, but it is a lucrative one… the 2016 AHIMA (American Health Information Management Association) Salary Snapshot for HIM Professionalsshowed an average salary in the field of $83,790. With that kind of money ahead of you, you can expect to have to shell out some big bucks for a solid education. In each region, most HIM bachelor’s programs tend to cluster in a certain price range, driven by demand, expenses, and other factors. We started at the bottom end of those ranges and chose only the schools in each region with the lowest total program cost. Though a number of schools here accept two-year transfer degrees and offer bachelor’s completion programs in HIM, to ensure an apples to apples comparison, all the price analysis we conducted and the tuition rates we show are based on the full four-year course of study. We know you don’t just make big decisions like this based on price alone. You can be sure these programs are low on cost, but they don’t compromise on anything to give you lower tuition rates. There are a lot of factors you will consider when picking the right bachelor degree to start your HIM career, and we present you with all of that information here. In addition to giving you the cost of the program and how it stacks up, we look at things like job placement rates, whether or not online courses are available, how closely the program is connected to actual healthcare agencies or hospitals, and pass rates on major industry certification exams, namely the RHIA exam. We also look at resources available to students and any special labs or facilities available to further your studies. With affordable, highly-quality programs available in every corner of the country, you won’t have any trouble finding an option on our list that gives you everything you demand from a four-year program in health information management, and that does it all while still offering the lowest tuition rates around. Missouri Western State’s BS in Health Information Management makes a big impact at an affordable rate – nearly $12,000 less than the regional average for similar programs at public schools. This is where you’ll earn a bachelor’s that’s designed to produce health information professionals skilled in the areas of planning, management, design, implementation, and more. Just a few of the perks of pursuing the BS in HIM here include: both part- and full-time options…individualized attention from an exceptional faculty…and the option of completing some courses online. As a HIM student here, you’ll be able to participate in the many activities that come along with the AHIMA-sponsored Health Information Professionals Week, and even work on the Advisory Committee that oversees curriculum and program changes. Yes, a well-rounded, robust course of study at a truly affordable rate is possible, and Indiana University Northwest proves it. The BS in Health Information Administration, whether on-campus or online, will prepare you for a career as a health information manager, privacy officer, healthcare technology specialist, among other professions where your analytical and technical skills are needed. Choose Indiana University Northwest and you’ll be able to complete your bachelor’s in HIM, whether you have no prior health information management educational background, or you already hold a two-year degree from a CAHIIM-accredited program. This program boasts a 90%-plus pass rate on the RHIA exam, a graduation rate of 90%, and a fully online course of study for all 300- and 400-level courses. The University of Toledo’s online BS in Health Information Administration not only comes with a truly affordable tuition rate, it’s been ranked among the top online health informatics degree programs in the nation. Plus, this program boasts a 100% program retention rate (Fall 2017) and the option of completing the program as a high school graduate or transfer student. With a well-rounded curriculum and a program cost that comes in over $2,000 less than the regional average for CAHIIM-accredited HIM bachelor’s programs at public institutions, the University of Toledo’s BS in Health Information Administration is your ticket to a career in any setting, from IT companies that contract for healthcare providers to medical insurance companies to government agencies. Chicago State University’s BS in Health Information Administration features a tuition that’s priced right, and a flexible curriculum that’s designed for either new students or for registered health information technicians looking to step up their game, and their prospects for promotion. Choose this comprehensive course of study and you’ll enjoy an immersive laboratory component—your opportunity to practice technical skills using current medical software in a state-of-the-art facility. This program also boasts an 80% graduation rate and an 83% retention rate. Whether on-campus or online, Indiana University’s BS in Health Information Management is affordable and comprehensive, providing you with a comprehensive and cost-effective route to a career as a health data analyst, coding specialist, privacy officer, and more. In addition to a convenient, online course of study, this program boasts a 100% job placement rate and a 100% graduate school acceptance rate. Thanks to the university’s strong healthcare focus, you’ll have access to exciting, hands-on opportunities at facilities like the IU School of Medicine, the IU School of Nursing, and the Roudebush VA Medical Center. And if you want to add a global element to your course of study, IU offers an international service-learning course to the Greek island of Paros. An affordable course of study in the science of health information management is yours through Ohio State University’s BS in Health Information and Management Systems. This program, which features a foundation in business and information systems, ensures graduates are well-prepared to enter all sectors of the healthcare industry. Just some of the perks of this program include: small class sizes (just 32 students accepted annually) …a 100% pass rate on the RHIA exam five years in a row…and a variety of hands-on experiences at locations like OSU Wexner Medical Center and other healthcare partners in the greater Columbus area. From coding and database design to systems analysis to project management, the BS in Health Information and Management Systems gives you everything you need to succeed in the exciting HIM field. Dakota State University’s BS in Health Information Administration is a cost-effective course of study that’s designed to produce effective and expert managers of medical information. Whether you design and manage health information systems or collect and analyze patient data, this program will provide you with the theoretical and hands-on training you need to succeed. Plus, it’s offered both on-campus and online for the best in flexibility and convenience. As a student here, you’ll work with professionals and experts in the field, and you’ll study under a faculty that’s active in professional health information organizations. For example, the program director has fellowship status with the American Health Information Management Association (AHIMA). You’ll also enjoy many opportunities to get involved in social, community service, and other professional activities, including the university’s Health Information Management Club. The management, collection, maintenance, and analysis of medical data requires a solid course of study, and Illinois State University’s BS in Health Information Management is where you’ll find it – all at a truly affordable price. This on-campus course of study boasts a solid record of success, including a 100% job placement rate for the past three years and a 100% RHIA examination pass rate in 2016. As a student here, you’ll also have plenty of opportunities to get involved through the Student Health Information Management Association, which hosts monthly guest speakers and participates in a variety of community volunteer projects. Ferris State University’s BS in Health Information Management is a cost-effective path to producing experts in the health information management field. But this program offers more than just an attractive price tag; in fact, it boasts a 100% employer satisfaction rate and a 92% employment rate among graduates. And it’s no wonder…Ferris’ College of Health Professions is dedicated to creating and maintaining a student-centered learning environment that seamlessly combines classroom activities, service learning approaches, practical experiences, and research and scholarship endeavors while promoting strong partnerships with various healthcare organizations. It’s also part of an established university that features a 16:1 student-to-faculty ratio, exciting study abroad opportunities, a host of student activities and organizations, and outstanding career services, just to name a few. Herzing University’s BS in Health Information Management is where convenience meets affordability! In addition to a price tag that comes in nearly $20,000 less than the regional average among HIM bachelor’s programs at private schools, this comprehensive and robust course of study is available entirely online for the best in flexibility. Whether you’re seeking a HIM career in hospitals, clinics, consulting firms, health insurance companies, or government agencies, this solid course of study will get you where you want to be in as little as three years. Or, enter the program with an associate’s degree and you’ll graduate in less than two years! An alumni network of more than 40,000, an industry-specific curriculum, and an expert faculty of experienced practitioners are just a few of the reasons students choose Herzing. DeVry University is never short on quality or value! Choose the Bachelor’s in Technical Management – Health Information Management degree and you’ll enjoy an outstanding course of study at an outstanding value – over $12,000 less than the regional average for CAHIIM-accredited HIM bachelor’s programs at private schools, in fact. Just a few of the contemporary and highly relevant courses found in this program include Healthcare Data Security and Privacy, Health Information Financial Management, Healthcare Total Quality Management, and Healthcare Statistics and Research. Choose this program and you’ll enjoy a fully online course of study that’s delivered through the university’s TechPath approach – a unique learning rubric developed specially at DeVry that focuses on collaboration, adapting to new structures, and getting comfortable with working with data by using a wide array of tech-forward tools. Clarkson College’s BS in Health Information Administration is where you’ll find a truly affordable course of study that’s never short on quality. At more than $4,000 less than the regional average for CAHIIM-accredited HIM bachelor’s programs at private schools, this program offers an exceptional value. Clarkson’s long track record of producing healthcare professionals dates back to 1888, representing a long legacy of excellence that carries forward even into high-tech fields like HIM. Thanks to a curriculum that prepares students to develop, implement, and manage health information and data systems, you’ll rest assured knowing you have everything you need to succeed in the exciting field of HIM. You’ll also enjoy the best in convenience and flexibility, thanks to fully online delivery and your choice of full- or part-time study. Want another reason to choose Clarkson College’s BS in Health Information Administration? This program boasts a 100% first-time RHIA exam pass rate. The College of St. Scholastica has long been a leader in the field of HIM education. After all, this institution launched the first bachelor’s HIM program in 1935 (then referred to as medical records)… the first distance-based HIM bachelor’s program in 1981… the first online master’s in HIM… and the first CAHIIM-accredited master’s program. The BS in Health Information Management upholds this record of innovation in HIM while still providing students like you with a cost-effective course of study that’s priced nearly $19,000 less than the regional average among HIM bachelor’s programs in private schools. It’s no wonder why Money magazine has ranked it among the ‘Best Colleges for your Money.’ Choose the College of St. Scholastica for your HIM bachelor’s and you’ll enjoy an esteemed faculty of active researchers… a fully online course of study… and accelerated eight- and 16-week courses. Why should you consider Franklin for your HIM bachelor’s? A cost-effective tuition that’s priced nearly $10,000 less than the regional average for CAHIIM-accredited HIM bachelor’s degree programs in private schools…a faculty of experienced healthcare professionals…a 100% online or on-campus course of delivery…and the opportunity to develop a major project for a healthcare-related agency. Whether your interests lie in analytics, coding, or management, Franklin’s BS in Health Information Management is for you, thanks to a dynamic curriculum that emphasizes healthcare management, IT, and organizational leadership. Choose this program and you’ll enjoy an engaged faculty, a collaborative learning environment, and student-centered resources designed to help you succeed. Today’s students are looking for quality and affordability, and SUNY Polytechnic Institute delivers on both, thanks to its well-rounded and surprisingly affordable BS in Health Information Management. This program produces effective leaders who can deftly address the latest issues and innovations in information management technology and its application for healthcare provider organizations. Plus, thanks to its fully online delivery, you can earn your HIM bachelor’s degree, regardless of your geographical limitations or professional obligations. Pursue the BS in Health Information Management at SUNY Polytechnic Institute and you’ll have access to the virtual laboratory of the American Health Information Management Association and Neehr Perfect of Archetype Innovations – two state-of-the-art online software labs that can be accessed anywhere Internet is available. Built on a foundation of faith and academic excellence, Saint Joseph’s College offers a Catholic liberal arts education at an affordable price. 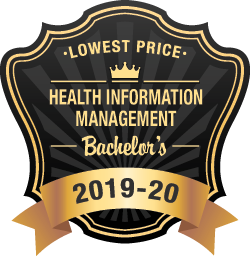 And the BS in Health Information Management is no exception, offering students like you the opportunity to earn a bachelor’s in the in-demand health information management field. This program is made for you, whether you’re a high school grad or a student who has already completed some college coursework. And, thanks to the program’s fully online delivery, you’ll never need to sacrifice quality because of geographical limitations or professional obligations. There’s plenty more to love about the BS in Health Information here, including: a faculty of HIM professionals…contemporary coursework that can be immediately applied to the workplace…and the opportunity to fast track your bachelor’s education into the school’s MHA program by transferring up to 12 credits of MHA courses for comparable undergraduate courses. Whether you’re a graduate of a two-year degree from Louisiana Tech or a high school grad, the BS in Health Information Management is your ticket to a career in HIM at an affordable price – more than $5,000 less than the regional average for HIM bachelor’s programs in public schools. Choose the Louisiana Tech BS in HIM and you’ll not only receive a well-rounded curriculum that prepares you for a job in coding or data analysis, you’ll have plenty of opportunities to get involved through volunteer work and participation in the Student Health Information Management Association. Need a program that gives you lots of flexibility? Choose online delivery and you’ll be able to complete your program anywhere there’s an internet connection. With a price tag that comes in nearly $7,000 less than the regional average for HIM bachelor’s programs among public schools and a course of study that emphasizes clinical and business decision making within the context of health information management, you’d be hard pressed to find a better fit than East Carolina University’s BS in Health Information Management. Available both on-campus and online for the best in flexibility and convenience, the HIM bachelor’s has everything you need for success in this high-demand field. Want another reason why you should put East Carolina on the top of your list? It boasts a 100% first-time pass rate on the RHIA exam. And it’s no wonder…this college remains the largest university provider of allied health professionals for the State of North Carolina. Southwestern Oklahoma State University’s BS in Health Information Management is proof positive that you don’t need to sacrifice quality for affordability. With a total program cost that’s nearly $2,000 less than the regional average for HIM bachelor’s programs in public schools, this program is easy on your budget. And its well-rounded curriculum ensures you’re prepared to make a difference in the dynamic HIM field, whether it’s as a coding specialist, privacy officer, or health information manager. After taking the two years of preprofessional curriculum, all your professional courses are delivered entirely online, either on a full- or part-time basis. Want even more options? Southwestern Oklahoma State offers the option of adding a second major in healthcare administration. Arkansas Tech University’s BS in Health Information Management is the perfect program for students like you with an eye on your budget. Priced nearly $6,000 less than the regional average for HIM bachelor’s programs in public schools, this program delivers the affordability you’re after. But it’s also a complete and comprehensive program that’s designed to prepare you for in-demand positions in the exciting and growing HIM field. Just a few of the areas of study in this program include the coding and classification of records…information and data management and analysis in a healthcare setting…compliance with standards and regulations…and the administration of health information electronic systems. Choose Arkansas Tech for your HIM bachelor’s and you’ll be part of a program that boasts a 100% student retention rate and 100% graduation rate. The BS in Health Information Management is a prime example of Texas State University’s commitment to global study. Through an exchange program with Germany’s Hochschule Hannover University of Applied Sciences and Arts, you’ll have the opportunity to study HIM in an international setting, if desired. And thanks to a comprehensive curriculum that’s designed to adapt to changing technologies and practices in the field of HIM and an affordable tuition rate that doesn’t break your budget, Texas State provides you with everything you need for success. The BS in Health Information Management is designed for you, whether you’re a high school graduate with no previous college coursework or experience, a graduate of an associate degree program in health information technology, or a student looking to complete a second degree. And thanks to its online and on-campus formats, you’ll be able to choose a course of study that doesn’t interfere with your personal and professional responsibilities. Tennessee State University’s BS in Health Information Management is where you’ll find a well-rounded program that seamlessly combines the disciplines of medicine, management, finance, law, healthcare, and information technology to prepare you for an exciting career in HIM. Choose Tennessee State and you’ll not only enjoy a competitive tuition, you’ll be part of a HIM program that boasts a 95% employment rate among graduates. Whether you’re a graduate of a HIT program or a high school graduate, this robust course of study is designed for you. With a low, student-to-faculty ratio, plenty of hands-on experiences within local healthcare facilities, and the option of minoring in general business, Tennessee State gives you everything you need to succeed. Yes, an affordable program can also be comprehensive and complete! Case in point: Southern University at New Orleans’ BS in Health Information Systems may be easy on your budget, but its curriculum delivers a punch. Want proof? This program boasts a 94% employment rate among graduates. Choose Southern University for your bachelor’s in HIM and you’ll be part of a program whose mission is to improve the healthcare delivery system while promoting lifelong learning. As a student here, you’ll have the opportunity to work in AHIMA’s Virtual Laboratory and gain access to a full array of health information technologies. At nearly $11,000 less than the regional average for HIM bachelor’s programs in public schools, Texas Southern University is a clear value. But it’s also tops for quality, as is evident by the job placement rate for graduates – an impressive 98%. Whether you enter as a high school grad with no previous college education or as a registered health information technician looking to advance your education, this program is designed for you. Choose Texas Southern and you’ll be part of an esteemed, historically black university system that boasts a diverse faculty, more than 80 student organizations, and an extensive alumni network that’s making its mark on the local, national, and international job market. The University of Mississippi Medical Center’s Bachelor of Health Informatics and Information Management offers up everything you need for success: a CAHIIM-accredited course of study… online delivery for the best in flexibility and convenience… and a competitive tuition rate. And, regardless of your needs, this HIM bachelor’s has you covered, thanks to a traditional, entry-level bachelor’s program for those without any prior college coursework, and a bachelor’s progression program for students holding the RHIT credential. Whichever program suits you best, you’ll enjoy a comprehensive course of study and a part-time schedule that allows you to earn your bachelor’s while meeting your professional and personal obligations. Choose the University of Mississippi for your HIM bachelor’s and you’ll be part of a program known for outstanding student outcomes, including a 100% employment rate among graduates. The planning, coordination, and supervision of the delivery of healthcare services is at the heart of Eastern Kentucky University’s BS in Health Services Administration – Health Informatics and Information Management, an affordable and robust course of study designed to prepare you for exciting jobs in HIM. Choose this program and you’ll complete a diverse curriculum that emphasizes healthcare management, health data analytics, and health data management. You’ll also be part of the university’s esteemed College of Health Sciences, which enjoys a reputation for its high success rates on licensure exams… state-of-the-art facilities… innovative opportunities for experiential learning… and a faculty of state, regional, and national leaders in health information management. For aspiring data analysts, privacy officers, and health information officers like you, the University of Louisiana at Lafayette’s BS in Health Information has everything you need to succeed. In fact, this comprehensive program not only prepares you for success on the RHIA exam and for careers in HIM, it arms you with additional skills in health informatics, thanks to an imbedded minor in this closely related area of study. The success of this program is evident—100% of the 2017 graduating class passed the RHIA exam. The Department of Allied Health ensures a well-rounded program, thanks to its long history of contributions to practice and collaborative learning… its dedicated faculty of scholars, researchers, and practitioners… and its support of student involvement with local, regional, national, and international organizations. Western Kentucky University knows what it takes to produce the next generation of health information management leaders and change makers. Its BS in Health Information Management is offered at a very competitive price, while still offering convenient online delivery and a well-rounded curriculum that seamlessly combines finance, information technology, medicine, and law. Want yet another reason to put Western Kentucky University at the top of your list? This program enjoys a 100% employment rate among graduates. Whether you are a high school grad or a graduate of a CAHIIM-accredited two-year program, this program is designed with you in mind. And if you have aspirations of adding a global element to your degree, the Office of Study Abroad and Global Learning offers a number of educational and cultural experiences through faculty-led, exchange, consortia, and other study abroad opportunities. WKU students have traveled to more than 40 countries, thanks to partnerships with the Cooperative Center for Study Abroad and the Kentucky Institute for International Studies. Alabama State University’s BS in Health Information Management blends medicine and information technology into one, comprehensive program that’s designed to prepare you for a successful career in the dynamic field of health information management. With a record of success dating back to 1998, the HIM program at Alabama State University equips students through a solid foundation in biology, medical terminology, pathophysiology, information systems, and more and through dynamic, year-long clinical affiliations with HIM departments within leading healthcare facilities. Choose Alabama State for your HIM bachelor’s and you’ll also enjoy opportunities to connect with your peers through the Student Health Information Management Association (SHIMA) and engage in exciting, hands-on learning through the 80,000 square foot John L. Buskey Health Sciences Center, which features a simulated records lab, three therapeutic rehab labs, and more. William Carey University’s BS in Health Information Management is affordable—priced nearly $20,000 less than the regional average for HIM bachelor’s programs in private schools—and comprehensive—featuring a curriculum blend of business and management, biomedical sciences, information technology, healthcare organization and delivery, and information and data management. This dynamic program features a variety of online and hybrid courses that include lecture classes, labs, and clinicals, all of which are designed to provide distance learners like you with an engaging and highly interactive course of study. Plus, as an online student at William Carey, you’ll enjoy a wealth of online resources to help you succeed, including Coaching for Academic Readiness Excellence & Success (CARES), a support and guidance program that includes a personalized learning plan built around your goals, strengths, and specific circumstances. Whether you’re a high school graduate, a graduate of a two-year RHIT program, or somewhere in between, the BS in Health Information Management program through Western Governor’s University is designed with you in mind. And with a total program cost that comes in about $50,000 less than the regional average for HIM bachelor’s programs in private schools, this program will prepare you for an exciting career as a data analyst, coding specialist, privacy officer, or other healthcare information expert without breaking your budget. You can be sure you’re receiving the most relevant and innovative curriculum, designed and regularly updated by experts of the Health Professions Program Council. The fully online delivery of this program offers adult learners like you the best in flexibility and convenience, while the competency-based program design is all about turning subject matter mastery into applicable skills.